Coca Cola is one of over 30 "participants" at WDW. Companies are permitted to test market new products and, of course, to sell their products or service. 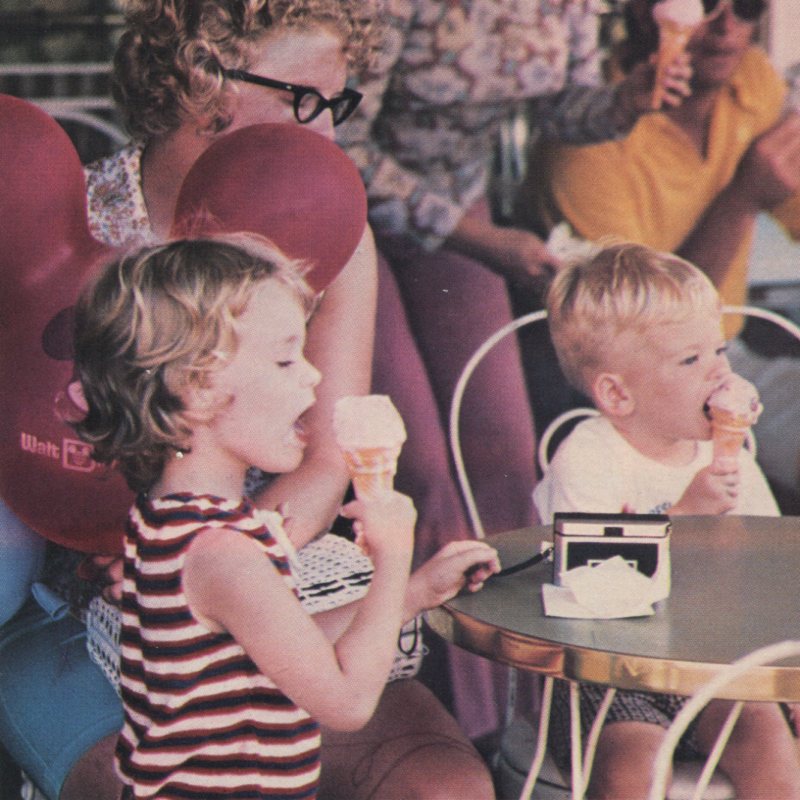 At Disneyland, during 1971 alone, enough soft drinks were consumed to fill a 5 acre lake 10 feet deep. Walt Disney Productions got into the foodservice business not because they wanted to, but because they more or less had to. 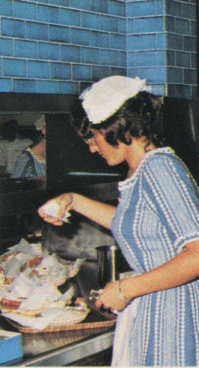 Foodservice at Disneyland was originally contracted out to a subsidiary of American Broadcasting Co. In 1965, Disney bought out ABC for $7.5-miliion so that they could do things their way. Disney reasoned that concessionaires tend to look on profits with individual units in mild and will, therefore, cut corners if need be to maintain their profits. Today, foodservice at both Disneyland and Disney World is "a part of the show." Food is part of the total experience and should be fun. Good value is part of the Disney philosophy, and this means quality food. Food prices at WDW are surprisingly low considering the quality and presentation of the menu. The food is simply good food that appeals to the various markets that WDW serves. The hamburgers aren't laced with Mickey Mouse ears, nor are scrambled eggs presented in the shape of Donald Duck. Each foodservice unit, whether in the parks or the hotels, is designed with a theme in mind, and the menu is designed to strengthen the Total Show. But gimmicks are minimized. If, to create this total atmosphere setting, one unit runs in the red, that's all right. Another unit or attraction probably has a high enough profit to balance it out. Jim Armstrong heads up the Food Division and is responsible for both ends of the country, John Cardone, food production manager, and Dean Penlick, operations manager, keep things moving at WDW. 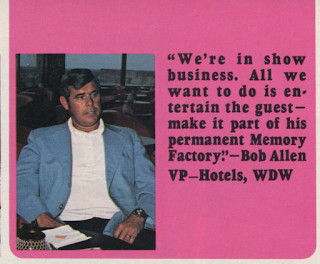 The plans for foodservice facilities for WDW were supervised by people who knew they would be transferred to Florida. As Cardone puts it, "we couldn't afford to make mistakes because we knew we would have to live with them on a day to day basis." 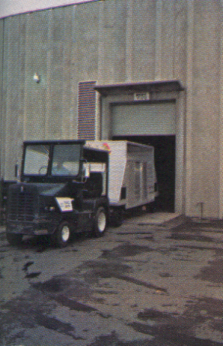 There is a Central Food Facility (never referred to as a "commissary") which receives all shipments and maintains inventory. 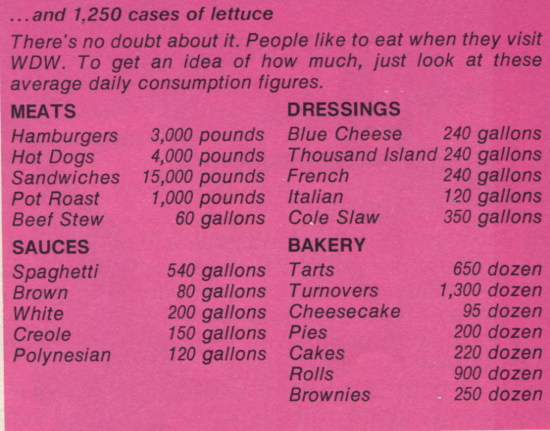 Meat and produce are purchased by carloads. All foods are processed and portioned at the Central Facility. 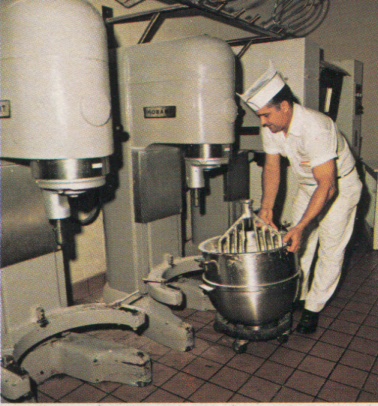 The kitchens in the Magic Kingdom are strictly for finishing and holding. There is a complete, underground transportation system- eight acres of tunnels and basements for service and supply facilities- so that guests never see food being transported or employees "out of costume." As with any operation serving 80,000 meals a day- an awkward size that's more meals than a local restaurant but not as many as a national packer- finding the right equipment is a real problem. 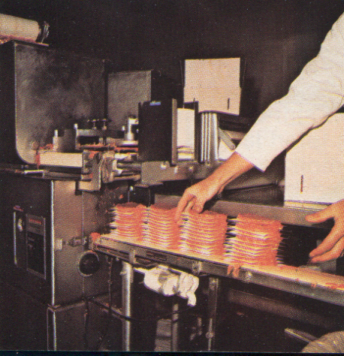 After many adjustments and modifications, the present hamburger machine can cook 2,000 4-oz. patties per hour, and toast the buns as well. Cardone is big on crepes and likes to incorporate them into as many menus as possible. He now has a machine that can produce 900 crepes per hour. The search for capacity in equipment is constant and right now is concentrated on a steak cooker. WDW has 21 new food facilities scheduled to open throughout the park within the next 24 months. The Central Facility, which is amazingly small- 48,000 sq. ft. - for its output- preparing food for 80,000 meals a day a day- will have to be expanded, too. And expansion means people. There are presently 130 Central employees, 1000 back of the house and 2400 front of the house. There are at least 14 middle management openings in foodservice now and that should increase to about 35 openings 10 months from now. "To hell with expense - experience is the most important thing." 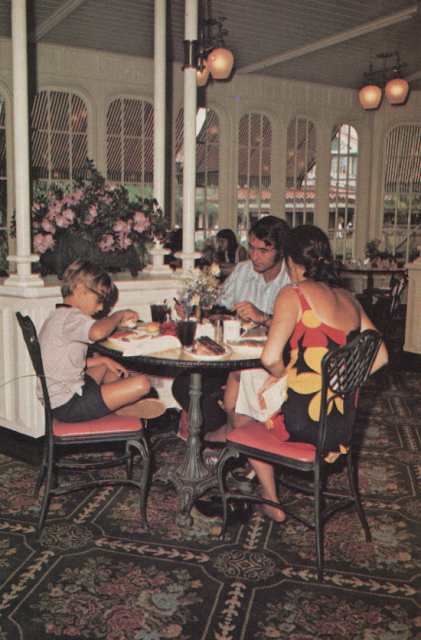 At the Crystal Palace, interiors cost a cool $1 million - but families can get a good meal here for about $1. Service is cafeteria style. 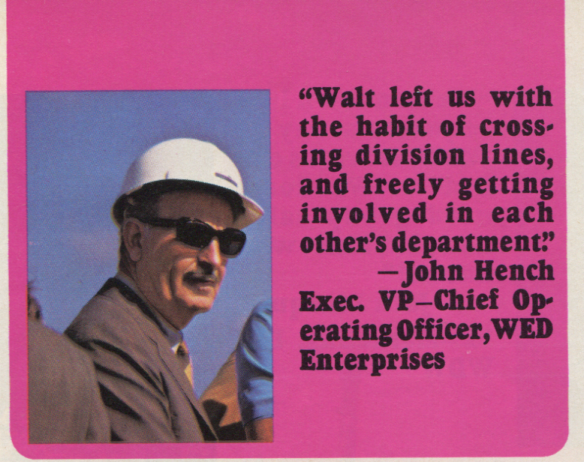 In the food division, as in all divisions, many management people come from within the Disney ranks. There are six area managers in foodservice. Six years ago, one was an ice cream scooper and another a bus boy. This kind of advancement gives employees something to look forward to: fringe benefits give them something for the present. Hourly employees are reviewed every three months, ticket books for theme park attractions are received with pay checks four times a year, and help is offered in educational pursuits for permanent employees. These inducements help keep turnover down. Bowling, sailing, boating, theatre workshops, and film festivals are but a few of the organized activities for employees. Meals are heavily subsidized by Disney and employees receive food prepared specifically for them, no leftovers. Right smack in the middle of all the hub-bub in the main lobby of the Contemporary Hotel is the Grand Concourse Restaurant. 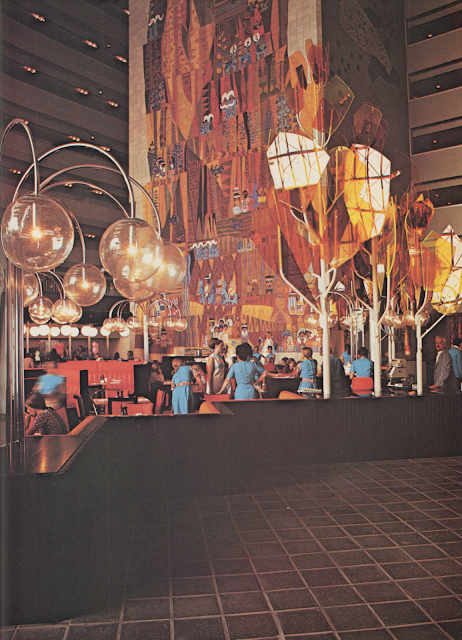 Guests sit under colorful plexiglass trees - and everyone stops munching when the monorail whizzes through the lobby. The restaurant is open until midnight - and a limited menu is complimented by a buffet, if desired. Elsewhere on the same concourse floor are shops, a bar, a liquor store - and anything your heart may desire. The main lobby is ten stories high, and a focal point is a huge, tiled mural. Quality, regardless of price, is constant. One of John's "specialities" is Macadamia Nut Pie, which sells for 75 cents a slice. The nuts alone are running $4.80 a pound right now. Hardly a profitable item! Since most people coming to WDW are from East of the Mississippi, Duck Nunis felt that a good old New England Clambake with lobster would be fun. When John was asked if the fluctuating, high price of lobster didn't bother him just a wee bit, he replied, "of course it does, but if he wants it, he'll get it, and for the right price." 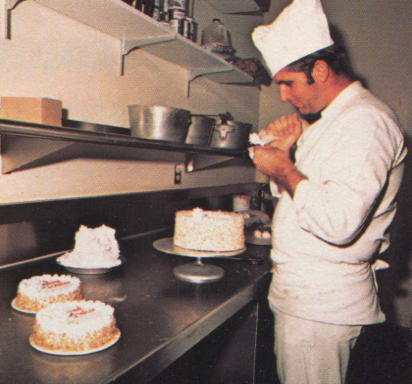 John has changed the menus for WDW eight times in 11 months. It took him 2 1/2 years to plan 11 basic menus. That means a lot of care and planning. Serving 80,000 meals a day requires a master plan which Disney management follows. Menu items have to fit the plan. A beef & cheese sandwich on marble rye is called the Moonsteer in Tomorrowland and the Jouster's Choice in Fantasyland. Very few items are used exclusively at any one location, unless a particular thing is absolutely necessary to maintain the atmosphere. 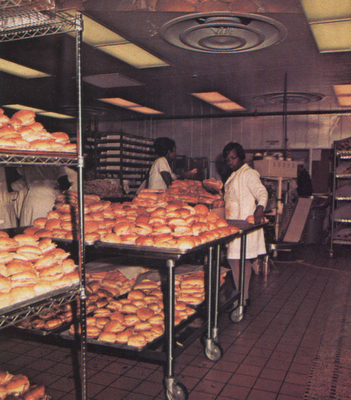 This is the case at King Stefan's, where individual loaves of onion bread are served. What is the trick to opening 40 restaurants at once? Cardone says, "You've got to be crazy not to want to do it. You'll never get that kind of challenge again." 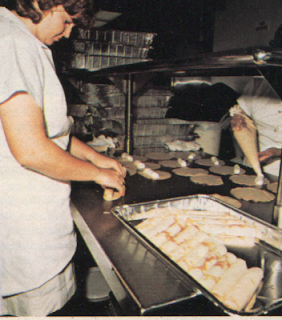 At the Central Food Facility, the cook isn't fixing up a batch of Witch's Brew. Throughout the facility, the most modern of equipment has been installed. 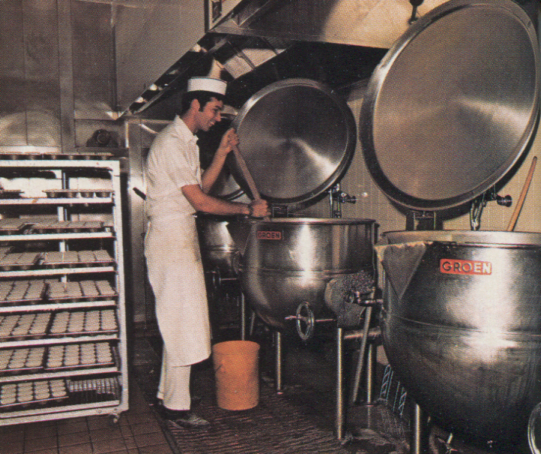 All food is prepared at the Central Foods Facility - cakes and pastries are prepared from scratch early each morning. 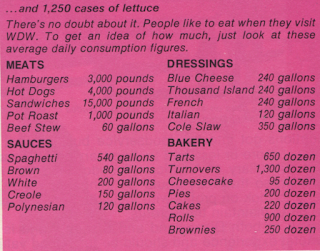 Sandwiches are big sellers but the 4 oz. hamburger patties is still the Number One favorite. Volume has exceeded expectation - and the CFF will be expanded next year. 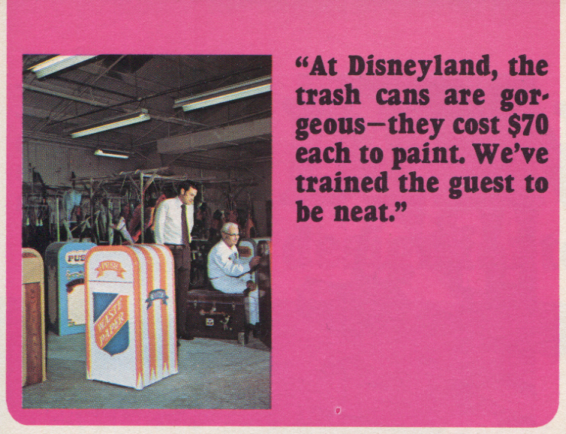 Sanitation is another very important facet of Disney foodservice. Can you imagine 60,000 guests leaving the park, all of them sick? Inspections are made continually as preventive maintenance. Equipment is kept spotless, as are the streets and walkways. Guests are shamed into throwing refuse into litter containers because the surroundings are so clean they would feel guilty if they threw a cup or gum wrapper on the ground. Menus are planned with maintenance in mind, too. Pizza and cotton candy are just two examples of foods not found in any unit. They connote a carnival atmosphere with people walking around eating food with their fingers and then littering with what they don't finish. With the exception of popcorn, which is a very high profit item and also very good, there is little else that people can stroll with and eat at the same time. Per capita, more food is consumed at WDW than at Disneyland and by far more people want breakfast. They arrive at the Magic Kingdom at 6 A.M. and they are hungry. Several of the Park units have had to add eggs to their menu. Buffets have been a blessing to the hotels. On a typical evening at the Polynesian, 1800 guests can be served in 40 minutes by means of an outdoor luau. This has been so successful that a protective enclosure is being added in order to serve the luau even if the weather is not the best. Two areas are reserved daily in the Contemporary Hotel for buffet breakfast, lunch and dinner. Buffets seem to work very well in letting Disney people exercise their expertise as people movers. Things seem to flow more smoothly, making for a more relaxed atmosphere. Disney even has its own unique approach to purchasing. Cost is not really considered. 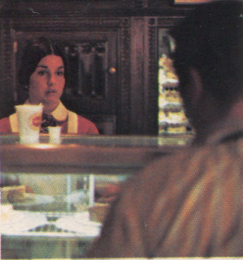 For example, if a fruit cocktail is to be selected, the purchasing department will get samples of several brands. They will be served, unidentified, to chefs and other management personnel. A vote is taken and whichever of the products wins out, that's the one that is ordered. That is Disney Democracy! No one goes to Disney World just to eat and no one goes especially to tour the kitchen. You go there for the total experience you can find nowhere else. The food is good, in some cases great. But if you are looking for the epitome of commercial foodservice you'd probably be better satisfied at Maxim's in Paris. Layout and design of kitchens and equipment is good, functional, and gets the job done, but you wouldn't call it avant garde or revolutionary. It simply gets a big job done. As John Cardone says: "We're in the entertainment business. We work while people play." The amazing thing at Disney is that people seem to enjoy their work so much that even though it is hard work, it seems more like they are playing along with the guests. Crepes are popular in any form, and at any meal, from entree to dessert. 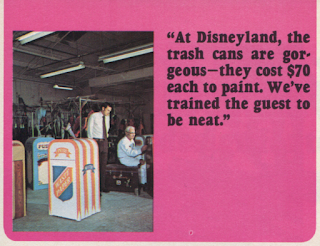 This is interesting, because I tend to grade park food on a scale of whether it's "good" or "good for Disneyland"... Trader Sam's is "good". Big Thunder Ranch BBQ is "good for Disneyland". Plaza Inn is somewhere between the two. Unfortuantely the avergae is not that great... I can cook up a better breakfast than the one offered from the River Belle Terrace, and a better steak than one of the pre-cooked monstrosities from the Blue Bayou. Thankfully I have not yet encountered food that is "bad even for Disneyland", but I haven't eaten everywhere yet! 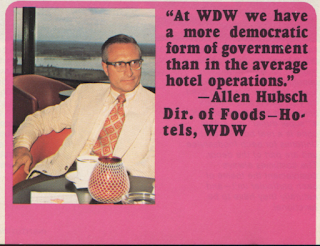 I know the point of reprinting these articles about WDW's early operating practices and philosophies is to open a discussion of the relative strengths and weaknesses of those practices and philosophies, including how they have changed over time, but, on a related topic, I am always pleasantly surprised by how good and varied overall the food is in Disney parks. Read, for example, A.J. Wolfe's comprehensive Disney Food Blog for any length of time, and you cannot help but be astonished by the variety and quality of offerings. I'm not talking just about restaurants like Victoria & Alberts, arguably one of the finest dining experiences to be had anywhere, but about the regular park food. Compare a typical fast-food meal at Pecos Bill's or Starlight Ray's with a fast-food meal at some non-Disney theme park (Universal, Busch Gardens, Six Flags, etc. ), and you'll quickly see what I mean. Consider experiences such as the EPCOT food and wine festival, now happening, and you enter a whole other realm of culinary experience. 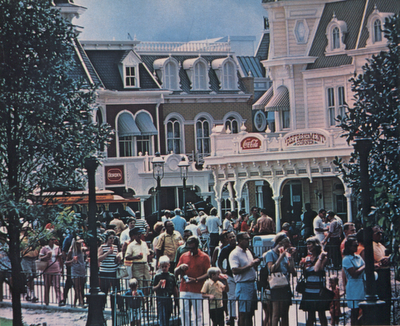 Walt Disney wanted to distinguish his park (eventually parks) from the normal amusement experience and that included food. It seems overall that that has been a stunning success. When you consider (again) the variety of dining experiences and the sheer numbers of people that Disney feeds efficiently on a daily basis, it is nothing short of astonishing. I look forward to your thoughts on this illuminating article.